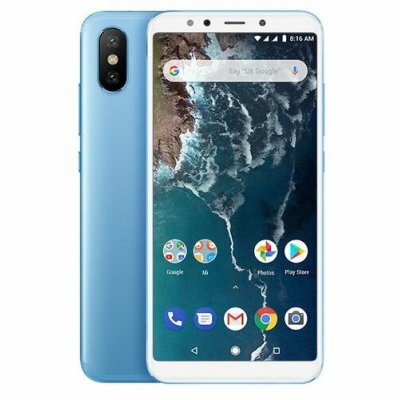 Successfully Added Global Version Xiaomi Mi A2 4GB RAM 64GB ROM 5.99 Inch Snapdragon 660 Cellphone Blue to your Shopping Cart. 20MP + 12MP Dual rear camera and 20MP Front camera, helps you take clear pictures and beautiful selfies. Ultra-thin design, fashionable and elegnat smart phone, easy to hold and operate with one hand. Snapdragon 660 AIE processor, smoother control & flagship-level performance, fast running even when multi-tasking. 5.99 Inch 1080P full screen, wider field of view, high-resolution touchscreen experience. Latest AI-powered innovations from Google built in, a phone that works smarter for you. 14nm FinFET processor exhibits high performance and consumes less power. Adreno™ 512 high performance GPU generates life-like visuals. Up to 2.2Ghz for consistently robust performance. With this Xiaomi Mi A2 smart phone, you are guaranteed a smooth running, high-performance and low power consumption cellphone. Take clearer daytime photos with the 12MP lens and large 1.25μm pixels. Low-light photos are brighter with the 20MP lens and 4-in-1 Super Pixel, based on pixel binning technology. Ultra-large 2μm pixels multiples light-sensitivity 4x. *Smart lens selection is available for Portait mode only. AI Beautify 4.0, 20MP front-facing camera for selfies. Everyone's beauty is unique. Show yours to the world with Xiaomi Mi A2. This smart phone has the amazing 5.99 Inch 1080P full screen FHD+ large display, 18:9 aspect ratio, and 2.5D Corning® Gorilla® Glass 5 display. Optimal drop-resistant and high-resolution touchscreen for your experience. Android One phones have the latest AI-powered innovations from Google built in. They can auto-adjust to your needs and help get things done more easily throughout your day! This cellphone is smart and practical for daily use.